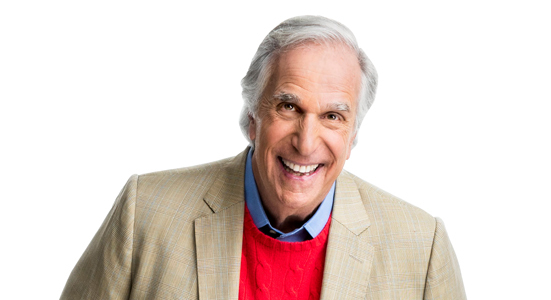 One of the last times Henry Winkler was in Oregon was to treat Portlanders to a sneak peek of his new series, “Barry.” Earlier this year he visited Seattle as part of his book tour for his popular Here’s Hank book series. 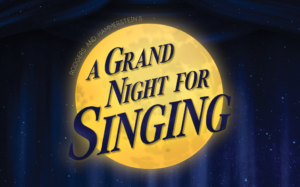 His travels bring him all over the United States and he often appears at Jewish organization’s fundraisers, including a 1998 Jewish Federation of Greater Portland gala. When you speak to him or watch interviews with him on television, his gratitude and humility about his success are evident. 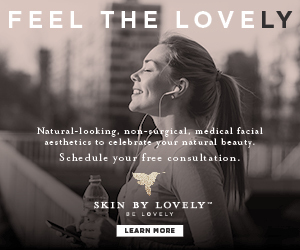 You never hear anything negative about him, which for someone who has been in show business as long as he has, proves that he is genuinely a nice guy – a real mensch. 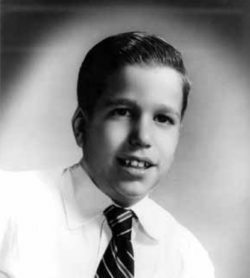 Henry as a young boy. Henry always struggled in school, he would notice that he wasn’t keeping up with the other kids academically, but he suffered in silence. “I was in the bottom 3% academically in the country,” he remembers. But an amazing revelation happened when Henry’s stepson, Jed Weitzman was diagnosed with dyslexia in the third grade. Henry was 31 at the time, and everything they were saying about Jed rang true about himself. “The first thing is you get very angry because you think, ‘Oh my gosh, all of that yelling, all of that grounding, was for naught,’ ” says Henry. His parents always thought he was lazy and wasn’t applying himself and would punish him for poor grades. Henry also came to the realization that perhaps he was successful in his career because the struggle actually made him stronger, that he had to fight through it and figure it out. He also had a 180-degree shift in his own parenting, as he realized that he too had accused his children of being lazy when it came to applying themselves at school. Henry has two biological children with his wife, Stacey. His daughter, Zoe, is a teacher, and son Max is a director. Both have dyslexia. That was the beginning of the collaboration between Lin and Henry that has produced 28 chapter books for young readers. The first series followed the “everyday adventures of a bright boy with learning challenges” named Hank Zipzer. Kind of sounds like someone familiar, huh? 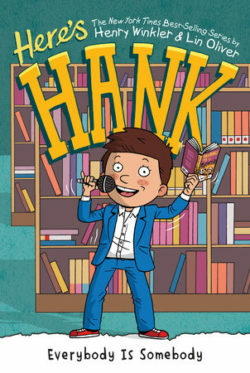 After 16 books in the “Hank Zipzer” series, Lin and Henry wrote 12 books under the Here’s Hank title, a prequel featuring the same character in second grade. 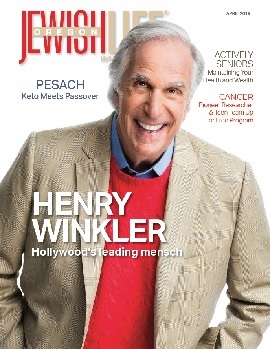 Fans of Henry Winkler, the author, need not fear. He has begun work on a new series of three books revolving around the theme, “don’t judge a book by its cover.” Like the Hank books, this series will be geared for children ages 8 to 11. The show ran for three years. . A related movie made called “Hank Zipzer’s Christmas Catastrophe” won the International Emmy Kids Award in the category for TV movie/mini-series. in April 2018. Henry says he wanted to be an actor since he was old enough to reason. He graduated from Yale University’s Drama School with a master’s degree in 1970 and started working as an actor. His first jobs were in commercials, as extras in movies and repertory theater. 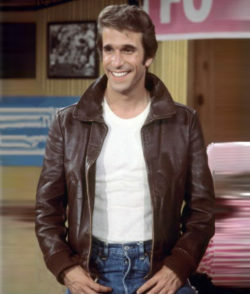 Then in 1974, a new show called “Happy Days” invited viewers into the idyllic home of the Cunninghams and introduced Arthur Fonzarelli, “Fonzie” or “The Fonz” to America. He is also an executive producer on the new “MacGyver,” which features Lucas Till as the young 20-something Angus “Mac” MacGyver. The original series ran from 1985 to 1992 and starred Richard Dean Anderson as the title character. Lucas was just 2 years old when the original show finished. Henry says it was “fantastic” to see the show’s resurgence and it has been consistently leading the ratings in its Friday night time slot on CBS. Filming also just wrapped last December on the second season of “Barry,” which is scheduled for release this spring on HBO. “Barry” is a dark comedy that follows a hitman from the Midwest to Los Angeles where he follows his “mark” into an acting class and decides that he wants to become an actor. 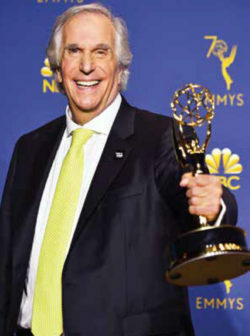 On Sept. 17, 2018, Henry took home his first Primetime Emmy Award for Outstanding Supporting Actor in a Comedy. “I have been nominated many times and stayed in that chair many times. This time I got to stand up, and that was fantastic,” says Henry. Henry’s mother, Ilse Anna Maria (Hadra) and father, Harry Irving Winkler, emigrated from Berlin to New York in 1939. His father was able to secure a work visa for six weeks. Harry was in the lumber business and imported and exported wood. At the time they left Germany, Harry knew they would not be returning, but he did not share his thoughts with his wife. Henry’s Uncle Helmut had planned to leave with his brother. Instead, he decided to wait an extra day for a dinner jacket that was being finished at the tailors. That night the Nazis came and took him. He was eventually sent to Auschwitz, where he died in 1942. Henry’s first visit to Berlin was documented during an episode of the show “Better Late Than Never.” During the show’s two-year run, Henry traveled the globe with William Shatner, George Foreman, Terry Bradshaw and “sidekick” Jeff Dye experiencing different cultures and checking items off of their bucket lists. The Stolpersteine that bears Henry’s uncle’s name. 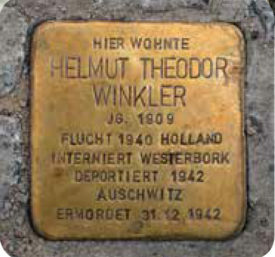 While in Berlin he was able to see the memorial plaque that bears his uncle’s name (called a Stolpersteine or “stumbling stone”) placed in the pavement in Nikolsburger Platz Park. These small copper plaques, created by the German artist Gunter Demnig, are used to commemorate the individuals’ last place of residence or work before they fell victim to the Nazis. In those first years in New York, the Winklers and other families founded a congregation, though it didn’t have a building for many years. They would rent out space in halls to hold services. Then they built a building on 66th Street between Broadway and Central Park. He also admits to often working on Shabbat, especially when making a television series. His arduous work schedule over the years hasn’t seemed to affect his marriage. Last year, he and Stacey celebrated their 40th anniversary. They married at the height of his fame during “Happy Days” – and he says the most important thing for him in those early years was to protect the children. “At that time, the paparazzi had some respect, and they really listened,” says Henry. “I said, ‘Please, I’ll stand here, and you shoot me, but don’t shoot the children.’ ” That’s why his children were rarely seen in the press. He talks with pride about all his children, but he ponders the fact that he has only worked with his son Max, the director, on student films. “He has never hired me professionally, and I am thinking of having a chat with him when we hang up,” says Henry. 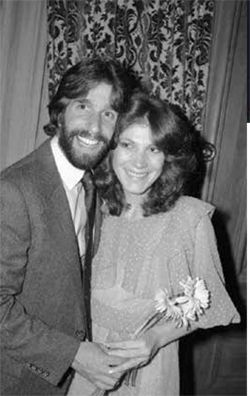 their wedding day, May 5, 1978. The universe must be listening to Henry right now, and after having the honor of chatting with him on the phone, and feeling his sincerity, humbleness and positive energy coming through, I can understand why.